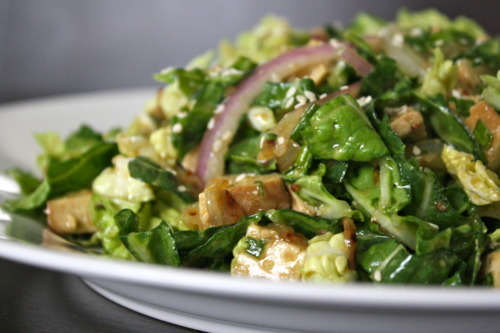 Behold the “Chopped Miso Salad with Savory Baked Tofu.”I made this for lunch on a dreary Monday a few weeks back. 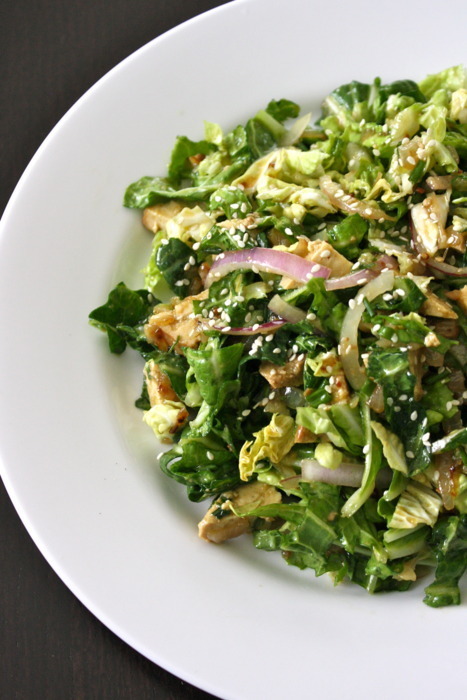 While this cool, crisp & savory salad might be better suited for a warm spring day, it certainly was a bright spot in my day amid the gloomy weather outside. 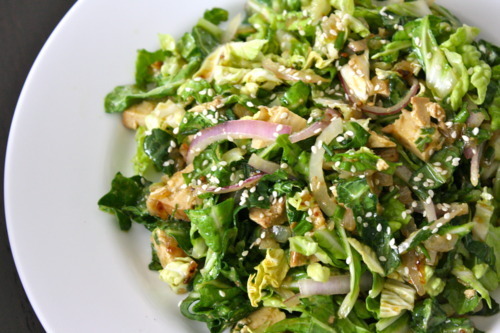 Gorgeous ribbons of napa cabbage, tossed with a rich & flavorful miso-sesame dressing, baked tofu, slivered almonds, & a pungent melange of red onion, shallot, & chives. Heidi’s recipes are typically foolproof, & while this salad was lovely on so many levels, it was a little too salty for my taste. Perhaps it was the miso, as I had to use both mellow white & red miso, as I was running low on the former. Regardless, I would test the dressing before adding the additional salt. I also prefer my salads lightly dressed, but found that there was far too much dressing in proportion to the salad for my liking. It was entirely my error, as I was starving & rushing to get this plated so I could enjoy it, & hastily poured in the entire contents of the dressing. Again, test it out, pour sparingly, as you can always add more, a little at a time until you’ve achieved the balance you desire. I should add that, like Heidi, I too cheated with the tofu & used the pre made savory baked tofu from Trader Joe’s. I aways have it on hand for salads, sandwiches, & such. I will certainly make this again, with minor modifications. It was fresh, & full of remarkable flavor, vibrant color & satisfying texture. Enjoy! Hampton Creek Foods Chipotle Mayo Review & Eggless Salad Recipe!